Even a review quote from the Mail on Sunday couldn’t put me off this one (although the idea of the Mail positively reviewing a book whose main characters are Syrian refugees is still making my head spin). I loved the sound of it from the start and was thrilled to receive a copy to review from Orion, thank you! We first meet Nour in her New York home, grieving after losing her father to cancer and remembering the stories he used to tell her, in particular the story of apprentice Rawiya and map-maker al-Idrisi and their adventures attempting to map more of the world than ever achieved before. We soon see Nour moving back to Syria with her two older sisters, Huda and Zahra, and her map-making mother, where they have comfort and support in the form of family friend Abu Sayeed; for her family, this is a return to home, but for Nour, who was born in America, it is an entirely alien country and language. This struggle for identity sets the scene brilliantly for Nour’s personal journey towards adulthood, something which I think is portrayed so well throughout the book in her thoughts, feelings, reactions and encounters. Not long after returning to Homs, bombing and threats of war see Nour and her family once more on the move: this time as refugees after they are left homeless. And it is here that we start to see Nour and Raiya’s stories really start to intertwine. As Nour’s journey unfolds, we are told the story of Rawiya’s journey alongside it. I loved the contrast between the two stories – the bleak and unflinching realism of Nour’s life as a refugee and the folklore-heavy tales of Rawiya’s adventures, as well as the many parallels between them – the strong heroines forced to disguise themselves as boys, the long and arduous journeys with many unknown dangers to be faced, the locations they travel through, and of course the central themes of the book: belonging, home, family, identity and courage. I’d read mixed reviews elsewhere, with many saying they couldn’t see the parallels and found the two narratives disjointed or jarring; personally, I found entirely the opposite. I loved the way the stories mirrored each other, whilst also being very different in tone and style. Alongside the broad parallels between the stories, there were so many moments when smaller, symbolic references between the two popped up which I thought worked so well (in particular the stars and stones) and I thought the way the stories came closer and closer together towards their endings was very effective. It worked brilliantly for me. The author notes at the end of the book show just how much research went into writing this, and it shows. The modern-day story of Nour is harrowing, tense and devastating by turn and feels incredibly raw and real; the historical tale of Rawiya feels firmly rooted in tales and characters passed down through the generations: it reads like a story that should be told in the oral tradition (which is of course how we are introduced to it, as a tale told to Nour by her father), and the characters and events are, as with Nour’s story, to greater or lesser degrees based on real people and events. Then there is the writing itself: lyrical, poetic, clever and captivating. As with the history and people, the landscapes and places are clearly well-known or researched, and more importantly well-loved (the shape poems at the start of each chapter are simply stunning). The use of colour is magical and again, very effective. Nour has synaesthesia, but unlike other books I’ve read recently where characters have this condition, it is not ‘a thing’; it is normal for her and reads as such, but also adds tremendously to the rich descriptions which take us with her on her journey (not to mention the story in a clever, but again under-stated way that I won’t spoil). I found myself wishing for a map, or more specifically, the talent and time to create one as I read: the visuals that accompanied this story in my mind were wonderful. This was a book I expected to devour, race through, inhale. Instead, it took a long time for me to finish: I savoured it, became immersed, journeyed slowly. I read much of it in short bursts, rather than long spells, pausing often to let each part of the story sink in and spending time digesting it, mulling it over, thinking back to it. It’s also a book that deserves to have incredibly broad appeal. While it is an adult fiction book, there are elements of younger fiction within it, notably the young main characters, the fantasy elements and the themes of growing up and finding out who you are, all familiar to so many younger books. Yes, there are some truly upsetting events (including a sexual attack, although not one described graphically) and it is unflinching in describing the devastation of war and the refugee crisis. However, I think many young adult readers would also enjoy this – it is by no means exclusively an adult book. The viewpoint of the protagonists makes it very accessible to a younger audience too. A simply beautiful book that I’m already looking forward to re-reading (despite having a proof copy, I have ordered the hardback as a copy for The Bookshelf). Full of compassion, wonder and hope, I can’t recommend this enough. When we were looking at which picture books we wanted out on the table in work this month, this one jumped out. “Pants!” the 4-year-old inner me cheered. Of course, we had no way of knowing at this point if it would actually be any good, but the illustrations looked promising (how can anyone resist a book featuring a raccoon dressed as a superhero and a penguin with pants on his head?!) So between the pictures and the pants we decided to give it a go…and I was delighted when it came in! Pandas wearing PANTS? Surely not! 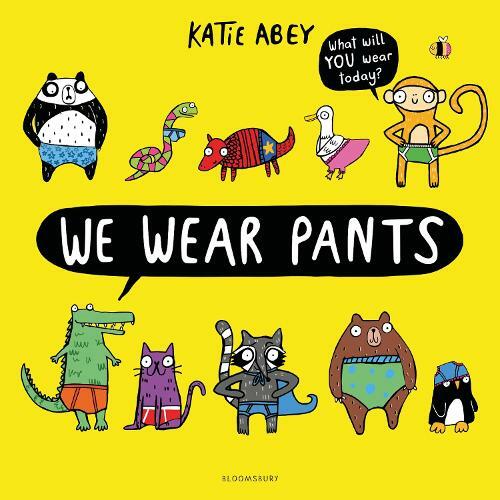 And what about wombats wearing wellies, sloths in socks or even…giraffes wearing scarves?Find all your favourite animals in this hilarious book about getting dressed.What will YOU wear today? On each double page spread we see a variety of animals donning various items of clothing: pants, wellies, hats, glasses, pyjamas, coats… with a cheeky monkey to find on each page proudly declaring that whatever everyone else is wearing “I’m not!” as he’s one step ahead each time. Until, as we reach the final page, everyone is dressed (even Monkey!) in an assortment of outfits. On the surface a book about getting dressed, this will have much wider appeal than the very youngest who might be reading it with that aim. Bursting with life and bright and busy illustrations, there is so much to spot on each page: “Look at the bee in his frilly knickers!” I exclaimed….”He’s got banana shoes!”… and so on. If I get this excited about it, little ones will love it. There’s also questions and captions in the form of speech bubbles from the animals giving prompts for specific things to find: “Count the rubber ducks”…”Who has odd shoes?”…”Who has the same scarf as me?” which would be easy to use a springboard for other observational/matching/sorting type questions, as well as for plenty of discussion about likes/dislikes. Perfect for fans of Pippa Goodheart and Nick Sharratt’s ‘You Choose’ range (You Choose, You Choose in Space and upcoming You Choose Your Dreams), this is one to return to time and again (no doubt finding something new each time! ), this is a colourful, funny and interactive book. 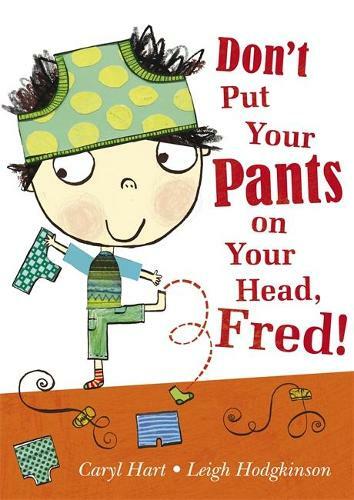 Brilliantly silly, rhyming books featuring all sorts of pants! Check out the youtube video here too! The hilarious ‘Aliens Love Underpants’ series from Claire Freedman and Ben Cort. Some more rather chaotic attempts to get dressed in this hugely funny, rhyming book. Any other pants-themed gems I’ve missed?! 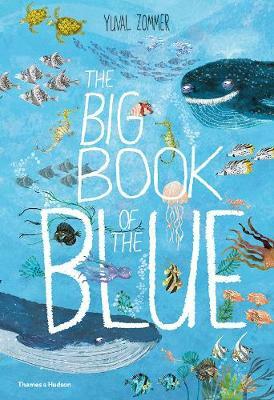 Meet all kinds of slippery, shimmery, powerful and surprising creatures from around the world in this first book of the ocean to share with young children. Already a big fan of Yuval Zommer’s Big Books of Bugs and Beasts, I jumped at the chance to get hold of a copy of his newest book for review (many thanks to Thames & Hudson). And I wasn’t disappointed! As with the first two – it’s a beautifully illustrated, well-balanced, carefully laid out, polished book that you (and any young’uns!) will want to dive into (sorry, couldn’t resist!) again and again. Each double page spread is illustrated from top to bottom with layers of detail, texture and movement; they are absolutely packed with things to spot and talk about – there’ll be something new each time you look at it! There’s also 15 sneaky sardines hiding among the pages waiting to be found, along with other ‘can you find’ challenges here and there in the book. There’s also a humour to the illustrations – while they are accurate enough in appearance to learn from and recognise, there’s no scientific diagrams here – the creatures have wonderfully quirky facial expressions and a lightness of touch which I loved – they’re sure to really appeal to children, and grown ups alike. Similarly, there’s a healthy dose of puns and humour in the text, especially in the sub-headings (“Claw-blimey!”…”Smell I never!”), appealing to both children’s sense of fun, but also the adults who’ll be reading it with them (“I wandered lonely as a…tuna” being a personal favourite). The facts themselves are set amongst the illustrations and presented as short snippets of information. Immensely appealing to even the most reluctant reader in its brevity, and addictive enough to have keen beans reading through them all in one fell swoop, barraging you with a torrent of “did you know…” info as they go (ok, I admit I’m basing this on the fact that when I brought it home I sat at the kitchen table with it and did pretty much exactly this to my poor other half while he made tea!). There’s a great balance too between a broad overview of ocean-life (including a double spread about the threats it faces) and more specific facts about particular creatures/species, as well as a simple index, contents and glossary (brilliantly titled “Fishy Phrases: How to talk like a sea-life expert” and laid out as the other pages are with each word/phrase illustrated nearby). This is a playful, engaging and incredibly visually appealing book that’s sure to be a hit with children of all ages and deserves a spot on every bookcase in homes and schools! Apparently Sunday was World Bee Day. I had planned to post this bee-themed post then, but the sun came out so instead I ended up sitting in the garden attempting to help plant things whilst avoiding spiders and, appropriately, watching bees and planning which plants to get so we get more of them once we have an actual garden that’s not a gravel pit. 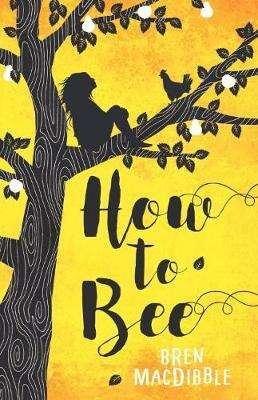 So, late to the party with both review and Bee Day post – here’s my review of the brilliant ‘How To Bee’ by Bren MacDibble, plus some of my other favourite bee-related books for all ages! I received an ARC of this from Bounce, on behalf of Old Barn Books, and wasn’t sure what to expect. I’d just finished reading the adult fiction ‘History of Bees’, which is – in part – set in a similar, all too plausible, future where bees are extinct and humans must take on the role of pollinators. I wasn’t bowled over by that particular book and was a bit wary of them being the same but different, similar message and story but for different target ages. I couldn’t have been more wrong. I loved this book. It’s claimed a space on The Bookshelf (for definite keepers!) When books are, as this one is, short, fast-paced and quite quick reads they need to be incredibly well crafted and I felt like this one got that spot on. On her website, we’re told “Bren was raised in a muddle of backwater villages, farms and towns in heartland New Zealand” and I think this really comes through in the scene-setting and world-building in the book. The descriptions of the farm Peony lives on with her Gramps, sister Magnolia and best friend Applejoy are rich, vibrant and incredibly evocative. This is contrasted brilliantly with the misery she sees on city streets and the luxury she sees in the house her mother works at. Peony herself was a fantastic main character – I was rooting for her from the very beginning. She’s fierce and feisty, determined and loyal, but most of all she’s nine and she reads like it, thanks in no small part to the relationships between her and her Gramps and sister, Magnolia, as well as the developing friendship she finds with Esmerelda. She gets upset and frightened. She has friendships and fall-outs. She enjoys the things all nine year-olds would enjoy: food fights, running, dancing. She’s protective, but still needs protecting too. Peony is happy on the farm she lives on, and aches to become a ‘bee’. However, we’re faced with her mother, Rosie – a weary, desperate woman who wants more from life and is promised it by an aggressive, controlling partner – she is trying to take Peony from the farm to ‘earn some real money’ in the city where she works. Here, Peony meets Esmerelda. They are like chalk and cheese and are equally dismissive and wary of each other at first. Over the course of the book, their friendship develops and despite their differences they start to try to help each other: Peony with Esmerelda’s fear of life outside her house, Esmerelda with Peony’s dream of escaping and returning to the farm. While on the surface this is a book about climate change and the environment (and while it undoubtedly highlights these issues and provides a good starting point for discussions about them), it’s really much more about family, friendships and home-life. There are some tough issues addressed: poverty/class divides, domestic abuse and loss for a start, but the way they’re dealt with is sensitive, not at all preachy, age-appropriate and very much in keeping with the story. Brilliantly written and hard to put down. Highly recommended. A brief note: this is NOT a brief post! It began as one, but soon became half a post on this year’s holiday reads and half a review of one of them: East is Eden. Dip in and out as you like! Before I go on holiday, I like to make sure I have plenty of books: I can manage somehow if I forget/run out/lose toiletries, clothes and the like, but books?! I’m not taking any chances. I also find holidays a great opportunity to read more ‘grown up’ books. Working in the children’s section, I get to read a lot of kid’s books and I love that – I love reading them, talking about them, recommending them, sharing them – some of the books I anticipate the release of most are children’s books (see this post on Square if you don’t believe me). But I do like to read adult fiction too, and often find that it’s these books that are forever being put to the bottom of my TBR pile in favour of new children’s releases, so on holiday I make a point of reading them. Which always throws up the inevitable: which books to take?! This year, I’d been saving my ARC of The Map of Salt and Stars (thank you Orion books, full review will follow!) and I’d bought The Bear and The Nightingale as that was one I’d had my eye on for a while. An ARC of Whistle in the Dark had arrived not long ago for me, so I took that as an easy-ish plane read for the start of holidays (review here) and Alice came up on a #banterwithbooksellers twitter chat and, as another book I’d often umm-ed and ah-ed over, but still never actually picked up, that went on the list too. I picked up The Refugees on impulse (maybe it’s because I’m not as keen on short stories, maybe not, but I just didn’t get into it.) After that I got a bit stuck. My manager and I started on one of those “have you read this?”…”but you must have read this? !”…”you haven’t read this? !” conversations around some of the classics/must-read type books. From this I picked up The Road (another book, like Alice, that I’ve deliberated over reading for years but never actually read) despite being warned not to take it as a holiday read since it’s so bleak (I compromised and put it to the bottom of the pile! ), Jonathan Strange (which didn’t actually make it on holiday with me: it was just TOO big!) and finally, East of Eden. I was warned not to come back to work if I didn’t like it, so highly regarded was this book, so it was quite a relief to find I enjoyed it! It did take me a chapter or two to get into, though I suspect more from my moving from one style of writing to a very different one than because of the book itself (does anyone else find this? I often get it when I switch from MG/YA to adult for example) but once I was into it, I was completely immersed. It’s an epic, a saga, a multi-generational family drama: all descriptions which make me think of a soap opera in book form. Luckily, that’s not the case. It is first and foremost, a retelling of the story of Cain and Abel; I wasn’t sure at first how I’d feel about this, but the way it was done won me over. I loved Steinbeck’s writing for so many reasons. Firstly, the characters: there are many. And to write so many characters, crossing so comprehensive a time period, whilst retaining their distinct personalities, as well as highlighting their inevitable similarities that feed into the Biblical ‘re-telling’ of the book is no mean feat. As with any family, there will be characters you identify with, those you’d like to have a drink with and, of course, those you want to shake some sense into or avoid altogether. I think part of what I enjoyed so much about this as the warmth each of them was written with and how real they felt – none perfect, all flawed, all individuals. Personally, I loved Samuel Hamilton, Lee and Caleb and, while she’s not likeable by any stretch of the imagination, I defy anyone to think Cathy’s not a fantastic character! The picture Steinbeck draws of the Salinas Valley area is rich and detailed and the homes there, as with their owners are distinct and feel well-suited to their various inhabitants but what I liked best about it was how I could feel it changing throughout the years over the course of the book. Then there is the writing itself – at times sharp and to the point and at others more philosophical; at times full of warmth and humour and love and at others despairing and bleak and cold. There were many passages, sentences, phrases and thoughts that I could have noted down to repeat here, but I won’t, because I suspect that as with the characters, everyone reading this will come away with their own favourites. It took up most of my holiday (I came back having only read 3.5 of the 7 books I took!) but it was a perfect read for long, sunny spells of reading and I really benefited from being able to spend long stretches reading it and getting drawn into it rather than stopping and starting like I have to when I need to fit reading in around ‘real life’. It has also made me determined to keep up reading a classic/must-read every now and then amongst all the lovely new books I get sent/pick up. Which would be your must-read recommendation? Which classics do you love/hate/want to read? These books, and consequently this review, contain references to: mental health, depression, self-harm and suicide. In the last week, I’ve read both ‘On a Scale of One to Ten’ by Ceylan Scott (thanks to Chicken House for the arc) and ‘Whistle in the Dark’ by Emma Healy (thanks to Penguin Random House for that arc). The first is aimed at YA, the second adult fiction. When I started this blog, my plan was to only review/blog about books I’d especially enjoyed – those I’d rate as 4 or 5*. I rated both of these 3*, but both resonated with me in various ways and got me thinking for various reasons. So, I’ve decided to post about them anyway, and as it’s Mental Health Awareness week too, it seems pretty fitting. Whilst they approach it from very different perspectives and are otherwise nothing alike story-wise, both books deal with teenage mental health, and contain references to self harm and suicide (although, interestingly, only the YA one mentions this explicitly on the cover). As someone who has suffered with depression and anxiety on and off over the years, but starting during my teens, I’m always interested in novels that deal with this, so was intrigued by both of these. It was the title that first made me want to read ‘On a Scale of One to Ten’ – 7 words that I hate. I don’t remember much about the various assessments and appointments I had as a teen when I was first diagnosed and rotated through a variety of tablets, but I do remember my most recent bout of anxiety and how frustrated/annoyed/angry I felt at this oft-used ‘assessment tool’ which didn’t come close to finding out anything about what was actually going on in my head, let alone helping with it. And, while much of the book focuses on Tamar cutting to self-harm, I was pleased (I’m not sure that’s the right word) to see her write about Tamar banging her head against the wall repeatedly too – doors and walls and fists and heads and scratches and nails and pinches etc. that play a big part in my own experiences and it was refreshing to see this represented. I suspect that, through the variety of characters and their many and varied illnesses in the book, there will be moments like this for many readers who’ve been through similar. However, there were also things I didn’t like as much: mainly the Iris at the weir plotline. I get that there had to be some sort of ‘other’ plot, but the ‘her friend died and she won’t say/we don’t know what happened’ thing just felt a bit tired (to me, personally), and I would have so much preferred this to be a book where there was no ‘major event’ triggering the illness – a representation of someone who has a mental illness just because they’re ill and not one triggered/worsened by – an external factor. Similarly, the Toby storyline, which I won’t go into in detail as I don’t want to slip into spoiler territory, but this storyline also left me unsatisfied and feeling like maybe opportunities were missed for this book to do something different. I suspect though, this is very much my take on it as an adult; who knows how I’d have felt if I’d read it as a teen? Which brings us to ‘Whistle in the Dark’. Although this also deals with teenage depression, in the form of 15-year-old Lana, it is written from an adult perspective, namely that of Lana’s mum Jen. Lana has suffered from depression for a long time and part of what I loved about this book was how well it showed the effects of this not just on Lana, but also on those around her, especially her mum and sister. It certainly took me back to my relationship with my mum during my younger years, and led to a fair bit of reflection. As much as ‘On A Scale of One to Ten’ felt like a wonderful insight into teenage mental health as it’s experienced, this felt like a window onto the world of those who live with/love someone who’s unwell and how upsetting/exhausting/frustrating it can be for them too. I loved the relationships in this, if it had been focused solely on that, I’d have probably rated it much higher. The relationships between Jen and Lana took me back, while her relationship with older daughter Meg felt so relatable now, and the relationship between Meg and Lana was also incredibly easy to relate to. However, the book focuses on the period shortly after Lana is found after having been missing for four days. Lana refuses to say what happened, and Jen becomes increasingly concerned about it. Some of this, I thought was brilliantly written, especially Jen’s worries about it. However, there were also elements that just felt unbelievable and the ending and resolution of this were ultimately what brought this down to 3 stars for me. So, two mixed reviews on two similar and yet completely different books. The one thing I stand by for both of them is their portrayal of various aspects of mental illness, which I think – in very different ways and for very different audiences – they each captured and depicted incredibly well. More information and support of mental illness can be found via the Mental Health Awareness website.